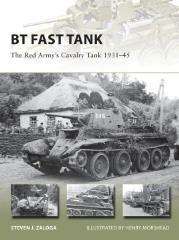 When the Red Army needed to mechanize its cavalry branch in the 1930s, the BT fast tank was its solution. Based on the American Christie high-speed tank, the Red Army began a program to adapt the design to its own needs. Early versions were mechanically unreliable and poorly armed but by the mid-1930s, the BT-5 emerged, armed with an excellent dual-purpose 45mm gun. It saw its combat debut in the Spanish Civil War in 1937 and was later used in the border battles with the Japanese Kwangtung Army in the late 1930s. The final production series, the BT-7, was the most refined version of the family. One of the most common types in Red Army service in the first years of the Second World War, BT tanks saw extensive combat in Poland, Finland, and the opening phases of Operation Barbarossa in 1941 and latterly during the 1945 campaign against the Japanese in Manchuria - this is the story of their design and development history.